Manuel Antonio National Park is a dense jungle teeming with wildlife. Manuel Antonio is Costa Rica’s smallest and most popular national park. Its coastal jungle ecosystem supports an extreme biodiversity, and you can spot many land animals, birds and fish there. Not to mention that the views are gorgeous. Unfortunately, due to its popularity with (especially American) tourists, Manuel Antonio is also the most expensive place to visit in Costa Rica. Still, it’s well worth the visit, and if you visit only one place in Costa Rica it should be Manuel Antonio. Doing Manuel Antonio on a budget requires a bit of good planning. This article helps you in doing so. This is the second part in the Budget travel guide to Costa Rica. First the good news. Manuel antonio is easy to reach by public transportation. The direct bus from San José (which departs from the Tracopa terminal) takes about 3.5 hours. There is also a slightly slower (colectivo) bus from Juan Santamaria International airport. Either bus costs around $8, and takes you to Quepos, a small town about 30 minutes from the famous Manuel Antonio National Park. Between Quepos and the park a public bus runs every fifteen minutes, costing less than a dollar (295 colones, January 2017). The bus has a stop near every major hotel or restaurant along the way. If you are waiting at the bus stop for more than a minute, you will notice that sometimes a car honks while approaching. Don’t worry, you aren’t doing anything dangerous. These are ‘colectivos’–not to be confused with the colectivo buses–shared taxis that go back and forth along the main road between Quepos and the national park. Riding along with one costs 500 colones ($1), regardless of the distance. If you hear one honking, just wave your hand and tell the driver where you want to go. Provided it is on the route, he will stop and let you out there. So if getting to and around Manuel Antonio won’t break the bank, staying there might. Unless you stick to these tips of course. As you get closer from Quepos to the national park, everything gets more expensive: accommodations, restaurants, parking, and souvenirs. Even the supermarkets close to the park have inflated prices. The last traditional soda restaurant–the backpacker’s go-to for cheap and tasty Costa Rican fare–is about 3.5km from the park entrance*. Pleasant Parque Nahomi in Quepos. Since the public bus is cheap, runs frequently, and is usually empty, it makes sense to stay farther from the park. Quepos itself offers the cheapest accommodations and the most choice of affordable food options (do check out the sodas next to the main bus terminal). It’s not a particularly nice place to stay, though. Also, it doesn’t have a good beach. 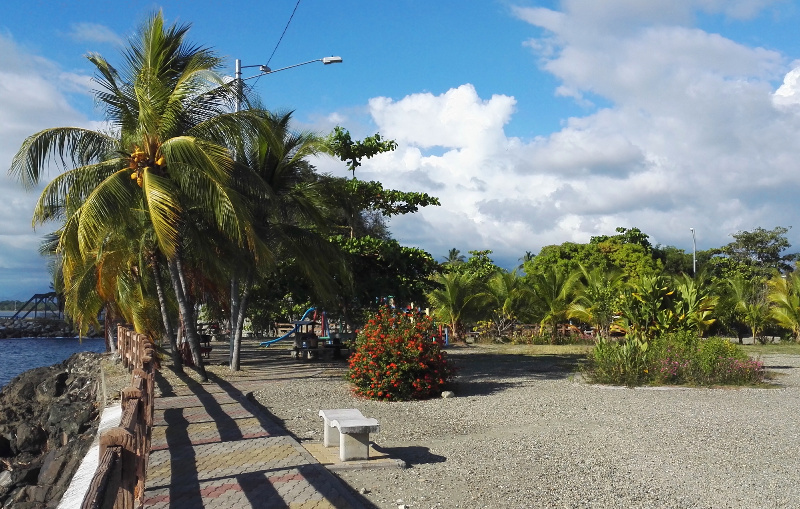 Still, the boulevard along the sea shore is a lively hangout place for the local youth, and Parque Nahomi (located on the South-Western edge of town, past the port) is a hidden gem for peace and quiet with spectacular views. If price is your primary concern, staying in Quepos is your best option. If you want to stay closer to the park and/or beach, make sure that you check the location for affordable lunch and dinner options nearby. It also helps to book something with breakfast included. There is just one main road between Quepos and Manuel Antonio park, it doesn’t have a sidewalk, and there is constant and aggressive car traffic. You don’t want to have to walk more than 500m to get food. Most restaurants are located right along the main road. Generally speaking, any restaurant that advertises its prices in US dollars is a poor choice. Chances are you’ll end up in the area that stretches from Hostel Que Tuanis to Hostel Selina. Dorm beds are available in that area for around $12-16 per night, and private rooms start at $28. I stayed at Blue Morpho House, a guest house 300 metres from the main road run by three charming sisters. For $28 per night I got a private room with bathroom (no air conditioning and cold water only), including a good breakfast. The place has a large patio with shared kitchen, from where you look straight into the jungle. I spotted monkeys, blue morpho butterflies, and coatis, while working on my laptop. I liked the place a lot, but it is not for those looking for a party. Manuel Antonio National Park itself is pricey at a $16 entrance fee, but it’s probably the reason you came all the way out here, so no way around it. I recommend getting there as early as possible (before 08:00 am), because later there may be long lines to buy a ticket and to get inside. Whether it is worth paying for a guide is subjective. There are so many guides around that, even if you don’t hire one, you can often overhear their explanations and see what they are pointing at. The only thing you’ll miss is the opportunity to ask questions and the use of their telescopes. The guides are far from cheap, at around $20 per person in a large group. Once inside the park there is nothing you can buy, so bring some fruits and nuts (no alcohol, cigarettes, or chips) or a sandwich to eat, and of course enough drinking water. In Manuel Antonio National Park there are quite a few (paved) trails to walk. If you want to do all of them it will take you some 4-5 hours, and of course you will also want to take breaks and look at the animals. While many people arrive in beachwear and flip flops, I would recommend wearing at least decent walking shoes. If you need to skip some trails because you lack time or energy, skip the waterfall trail near the beginning. The waterfall isn’t very impressive, and it’s the most crowded walk (except for the main artery of the park). Pristine Playa Espadilla Sur in Manuel Antionio National Park. If you can make it, do go to the viewpoint (mirador). It’s a steep climb, but you will be rewarded with a magnificent vista. The loop trail at Punta Catedral is also worth it, and again requires some climbing. The trail that leads to Playas Gemelas and Playa Puerto Escondito is not all that interesting, and only worth the effort if you want to visit those beaches. And that brings me to the next point. to budget some time to spend on the beach. Manuel Antonio has some lovely beaches in the park, and since you already paid to get inside you might as well take advantage of them. The first beach you encounter at the end of the main road is Playa Manuel Antonio (on your left hand, as seen from the road in). It’s the most crowded beach, and for that reason the least appealing to me. If you cross the little isthmus, past the vertical viewing tower (not worth going up), there is a second beach also named Playa Manuel Antonio, which is markedly quieter. The best beach lies a little further on: Playa Espadilla Sur. If you walk all the way to the bathrooms at the end, you’ll find a wide sandy beach with almost no one using it. There are two more beaches on the South side of the park. Playas Gemelas is very pretty and not much used, but it has dangerous rip currents. The official advice is not to swim there. Use your own judgment, but if you don’t know what a ‘rip current’ is or are not a good swimmer you should probably avoid it. Finally there is Playa Puerto Escondito, the farthest and most secluded beach. It requires a long walk and a climb down a ladder to get there. While the surroundings are absolutely gorgeous, the beach itself is rocky and not comfortable to lie down. The park closes at 16:00, and if you enjoy both hiking trails and lying on the beach you can spend a full day there. If you have just one day in Manuel Antonio, this should be it. If you have more time, visit Quepos with its marina and Parque Nahomi. This will keep you occupied for another half day. 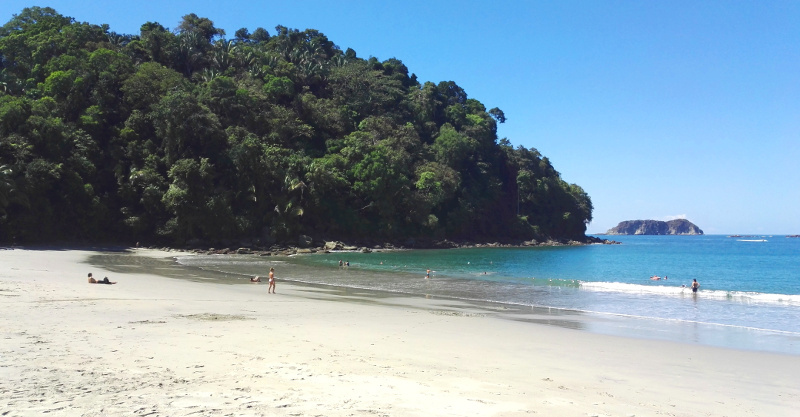 There are some free beaches in Manuel Antonio, outside of the national park boundaries. Playa Espadilla is the best known one, but it can get very crowded. My recommendation would be to visit Playa Biesanz. It’s a small and hidden beach, about 3km down a steep road off the main thoroughfare. You’ll find this road in between the Falafel Bar and the spa/mall building, about 3km from the park’s main entrance. Follow it until you pass the giant white Hotel Shana properties. You will probably encounter a few parked cars, and next to a garbage container there is a small path to the right leading into the woods. Follow it for 5-10 minutes and you arrive at the secluded Playa Biesanz. This beach doesn’t have velvety-soft white sand, but the water is incredibly clear and calm. I highly recommend bringing snorkeling gear, as there is a lot of marine life visible just below the sea surface. You can also rent the gear, but it costs $10, which is a bit of a waste if you’re trying to do Manuel Antonio on a budget. If you want to use the bathrooms and showers it costs $1. There aren’t many people on this beach, but it isn’t empty either. So you can feel safe, while at the same time having your private tropical paradise for the day. If you have even more time in Manuel Antonio, there aren’t many great free or cheap activities available, other than lounging on the beach for multiple days. That doesn’t mean there is nothing to do. Like any tourist destination in Costa Rica, Manuel Antonio offers ziplining, whitewater rafting, and also fishing expeditions. If you’re into fishing, this may be the best place to do it, although the charter boat with guide won’t come cheap. Ziplining is better done elsewhere (specifically, in Monteverde). I’ve been told that there is a particular stretch of the Naranjo river, called ‘El Chorro’, which is an exciting (class V) rafting spot. A half-day rafting trip to El Chorro will set you back around $85 per person. Altogether you can spend two full days and two or three nights in the Manuel Antonio / Quepos area on a tight budget, even if you include the expensive entrance fee. If you book your accommodation well in advance, at a place that includes breakfast and is near one of the sodas, you should be able to do this trip for around $100 per person (3 nights), including transportation to and from San José. *The closest soda to the park, as far as I know, is soda ‘Paz del Paraiso‘, with soda ‘El Angel‘ just slightly farther along the main road. Across the road from El Angel there is also Sancho’s, a rowdy American-style bar that serves Mexican food for under $10.